We do not charge anyone, all jobs on our site are free, Please do not Pay anyone for Jobs listed on our Site, or Pay on your own risk. We are not Responsible for any thing.Keep visiting us for upcoming confirm Jobs. A Contracting Company located in Dubai is in need of DM License Civil Engineer. 1: UAE Experience (2 Years). Benefits: As per UAE Labour Law, details will discuss later. A Contracting Company located in Dubai is in need of General Laborer. This is very Urgent Hiring. Candidates with UAE Experience only apply. Pakistani, Indian and other Asian National only. Mason, Carpenter, Steel Fixer only. A leading Contracting company in Dubai is looking a Project Coordinator / Technical Office Engineer. 3: Knowledge in Arabic with minimum of 4-8 years with relevant gulf experience. 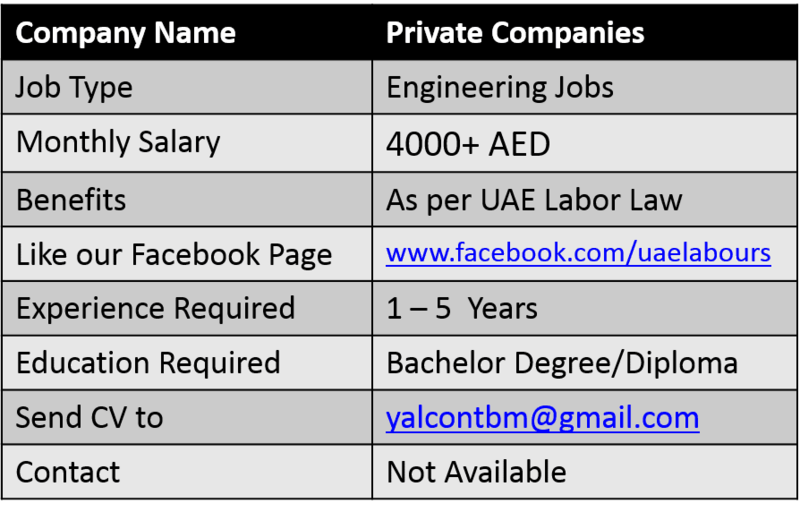 4: The applicant must be based in UAE. Note: Please mention Ref. No. TOCENG-03 in your subject line. Applications without Ref No. will not be consider. A leading construction Company in Dubai is looking for a Draftsman (MALE only) on visit visa with minimum of 3 years with relevant gulf experience. The applicant must be based in UAE. Note: Please mention Ref. No. DRFC -05 in your subject line. Applications without Ref No. will not be consider. Civil Engineer, male, B.E., with 5 years experience in civil and finishing Engineering works, required for a construction Company. A reputed contracting company in Dubai is looking for a Project Manager with a minimum of 15 years of Gulf experience in the construction industry should be able to run projects independently. Salary: To be Discuss Later. I have the honor to state that as per career opportunity at Maintenance /repair/steel building works / Rail construction /civil /structural works and industrial sector for the post of project engineer ,I am interested and do hereby offer myself as a candidate for the same . I have about 28 years Experience on shipbuilding/maintenance/steel fabrication & construction and Refit steel works/ shipbuilding industries works as ship Repair Manager /shipbuilding superintendent about 12 years on abroad in UAE also. I have completed Safety EHS, PTW Course from Dubai.I am sending my cv for kind consideration.